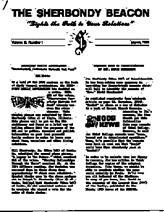 The Sherbondy Beacon is a newsletter which was published 3 times each year in 1984, 1985 and 1986 by The Sherbondy Family Association. A total of 160 pages were published. 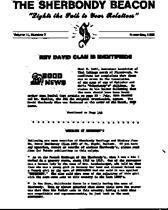 The newsletter helped to create ties of fellowship and kinship among the living members of the Family. The publication includes genealogical and biographical information on the ancestors of Sherbondy Families. The contents include births, graduations, marriages, deaths, vacations, awards, promotions, newspaper articles and other events and activities from all branches of The Sherbondy Family. This includes all of the descendants of John Sherbondy, who died in Westmoreland County, Pennsylvania in 1798. Plus, there are articles on topics of Sherbondy heritage, places, names, coat of arms, biographies, histories and photos of your ancestors and persons researching Sherbondy ancestors. The past volumes are available for purchase. Click on this link for information. An on-line newsletter may start if someone can put it together (information would be supplied to you). If you are interested helping with this, please let us know or visit the volunteers needed page. NOW Order On-Line, a new feature! Browse the Clan Index of the Newsletters, another new feature! Which Volumes have my Clan?